From vast mountains, to thick forests and magnificent geysers, Yellowstone National Park is a site to behold. Straddling the states of Wyoming, Montana and Idaho, the park is one of America’s most impressive places. Neuschwanstein Castle is as romantic as it gets. Located high above the village of Hohenschwangau in southwest Bavaria, Germany, the castle looks as though it’s come straight out of a fairy tale. The Waitomo Glowworm Caves are located on the North Island of New Zealand. This amazing space appears to be lit by stars, but the actual culprits are Arachnocampa luminosa, a species of glowworm only found in New Zealand. The remote Isle of Skye off the coast of Scotland is a pretty impressive location, but its famous fairy pools are something else altogether. Vivid blues and greens, they’d be better placed on the set of Avatar. One of the largest forts in India, Chittor is truly staggering. Now a recognised World Heritage Site. The fort was once the capital of Mewar. The views from this hillside monument are incredible. With its crystal clear waters and reefs teaming with life Australia’s Great Barrier Reef is remarkable. Not only is it the largest reef on Earth – it’s the largest living thing on Earth and can be seen from space. Located deep in the Guatemalan rainforest, the temple complex of Tikal is a difficult place to find. But when you there you'll be rewarded with a chance to explore the most impressive Mayan ruins on the planet. The Atacama Desert is the driest place on Earth. Some places haven’t seen rain for decades. The result; a landscape more akin to the surface of Mars than the north of Chile. Breathtaking. This epic cave complex can be found I the area around Page, Arizona. Millennia of flash floods and rainfall have etched this impressive canyon into a series of mind-bending structures. Bordering both Brazil and Argentina, the unfathomably large Iguazu Falls make up the largest waterfalls system on the planet. Hands up if you thought that title went to Niagara? Religious site, mediaeval village and all-round stunning location, Rocamadour clings precariously to the wall of the beautiful Alzou canyon in south-east France. Hvítserkur is a 15-metre high rock formation off the coast of north-west Iceland. Legend has it that the monolith is a actually the remnants of a troll, petrified in stone. True or not, it's well worth a visit. One of the seven wonders of the ancient world, the pyramids at Giza are probably the most famous historical landmarks on the planet, and they’re still as impressive as they were thousands of years ago. Located high in the Andes Mountains in Peru, this 15th-century Inca site is truly remarkable. After a difficult climb, this impossibly remote site affords incredible mountain views. Bagan is an incredible ancient city home to more than 2,000 Buddhist monuments. This awe-inspiring landscape is best enjoyed from the air, unless of course you're not a fan of heights. Thanks to a miraculous geological fluke, the Zhangye Danxia Landforms appear almost otherworldly. Layers of coloured minerals and sandstone combine to give these hills a rainbow effect. The Li River, is one of China's most famous scenic areas and it’s not hard to see why. Banked by towering limestone cliffs, this stunning part of China is entirely mystical. Salar de Uyuni is the world’s largest salt flat. Once a lake, this incredible natural formation is utterly breathtaking and lies in the heart of the Bolivian Andes. On the outskirts of Kyoto, this impressive bamboo grove is home to thousands of the towering plants. Weave your way through this beautiful forest and it’s impossible not to be inspired. 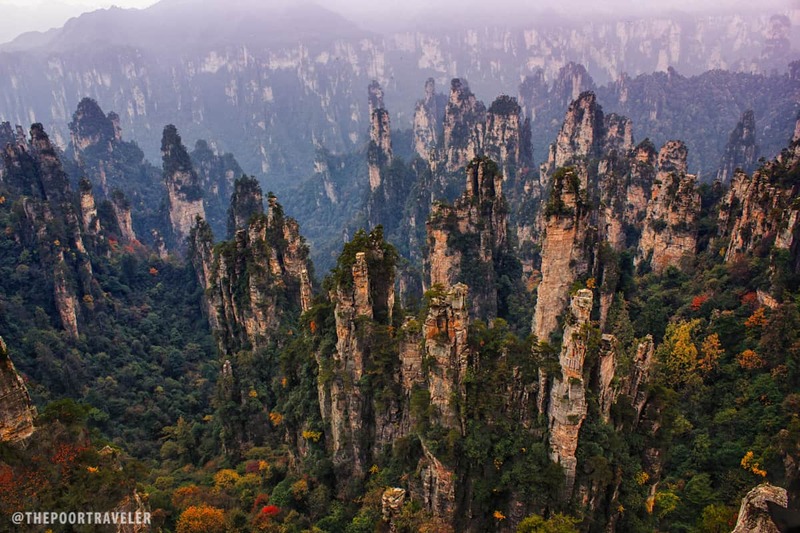 The 400 million-year-old Tianzi Mountains were formed from quartz sandstone and need to be seen to be believed. These surreal structures rise up over a kilometer and are topped with trees and plants. Surrounded by inaccessible mountains, the monasteries on the top of some of these jagged peaks appear to be carved out of the rock on which they are built. A truly awe-inspiring site. Deep in the jungle outside Siam Reap in Cambodia, Angkor Wat is a complete surprise. Looming out of the steamy forest, the temple complex is the best preserved Khmer ruin in the world and has inspired travellers for generations. Famous for its vast waterfalls, ancient trees, epic valleys and sweeping meadows, this is one of America’s most treasured national parks. With almost 1,200 square miles to explore, you could wander this wilderness for months. Overlooking the deep blue of the Aegean Sea, Santorini is famous for its beautiful whitewashed houses that balance perilously on the cliffs high above the waves below. This is one place you won’t be any hurry to leave. This incredible park located in in Hitashi, Japan is amazing all year round with flowers ready and waiting to blossom depending on the season. But in April this place is almost miraculous, with 4.5 million flowers in bloom. In the southwest of Jordan is a city carved into the rocks. Petra dates back to 300 BC and was the capital of the Nabatean Kingdom. For obvious reasons, Petra is also sometimes known as the Rose City. Naica Mine, also known as the Cave of the Crystals is not one for the faint hearted. Located 300 metres underground the cave is home to unbelievably large crystals, some reaching up to 12 metres in length and 55 tons in weight. The seafront along Portugal’s Algarve coast has a number of these beautiful caves to explore. The most famous is Benagil Cave and boasts a beach in its interior. With emerald seas and thousands of limestone cliffs rising out of the depths, Hạ Long Bay rightly deserves its place as one of Vietnam’s tourist hotspots. Take a traditional junk to see these beautiful structures from the water. For thousands of years people have bathed in the salty pools that make up Pamukkale, cotton castle in Turkish. The thermal waters cascade down terraces and over time have turned them completely white. The terraced rice fields of Mù Cang Chải in Vietnam's Yên Bái province appear to have sculpted the surrounding hills. Imagine every shade of green there could possibly be and you’ll come close to envisioning this magical place. Located on the border of Arizona and Utah border Monument Valley is studded with hundreds of sandstone structures, moulded over time by battering winds and former rivers. You’ll probably recognise this place as a filming location from countless Westerns. Vietnam’s Hang Son Doong cave is grand. Over 200 metres high, 150 metres wide and 5 kilometres long, the cave has its own micro-climate, river and jungle. It’s literally a world within a world. Within Plitviče Lakes National Park, a 295 square kilometre forest reserve, is a series of 16 terraced lakes connected by waterfalls. Needless to say, the site is one of Europe’s most impressive natural attractions. With its gondolas canals and romantic squares, Italy’s famous floating city will never lose its appeal. But you’ll need to be quick. This ancient city is gradually sinking into the sea that surrounds it. Famous for its hearty, rustic cuisine, fields of fragrant lavender and white stone valleys, Provence is quite possibly the most beautiful region in France. There are so many stunning sights to see it’s hard to say where to start, just grab a flight to Nice and take it from there. Located on the north-west coast of the Greek island of Zakynthos, this beach has been described as the best in Greece, if not the world. With turquoise waters and white stone cliffs, it’s not hard to see why. Victoria Falls are known locally as The Smoke That Thunders. Arrive here during rainy season and you’ll see millions of litres of water belting down the cliff face. With all the mist rising up from this roaring torrent, the name suddenly makes a lot of sense. A series of sandy islets, complete with luxury cabins in many places, surround an iridescent blue lagoon. It may just be a tiny island in the middle of the Pacific, but Bora Bora quickly conjures up images of paradise. Situated in the heart of the Canadian Rocky’s, Moraine Lake is as picturesque as they come. This glacial fed body of water is surrounded by mountains and forests and takes pride of place in the Banff National Park. Holland is famous for its tulips. But many people might be surprised to here that they aren’t all confined to greenhouses. Come at the right time of year and you’ll be surrounded by millions of these beautiful flowers in a rainbow of colours. The Geiranger Fjord is one of Norway’s most famous. A UNESCO-protected site, the fjord is banked by snow-capped mountains, rich forests and towering waterfalls. Utterly majestic. The fact that Mount Roraima borders three South American countries should just about give you an idea of the scale of this place. At the top of this incredible mountain is a lost world, home to many species found nowhere else on Earth. Vatnajokull is just one of many caves located in the heart of this Icelandic glacier. This isn’t a solo pursuit as the caves can be very treacherous, but it’s totally worth the effort of arranging a tour guide. The site of a Hindu temple and shrine, it’s not hard to see why the Batu Caves have a religious significance. This complex of caves situated inside a limestone cliff are truly awe-inspiring. Cappadocia is so distinctive it could be nowhere else. This arid corner of Turkey is punctuated by stacks known as fairy chimneys and Bronze Age home carved into the walls of the valley. The Faroe Islands have a mythical status. Located far to the north, these remote islands are home to some stunning geological features, none quite as spectacular as the landscape at Gásadalur. Located on Big Sur, California. The stunning McWay Falls flow all-year-round. Standing 24 metres, the falls originate from McWay Creek in Julia Pfeiffer Burns State Park. Semuc Champey appears from the temperate forests of northern Guatemala like an oasis. As the river makes it down this steep valley, it creates pools of bright blue, green and yellow water, all of which are perfect for a dip.